Three boys have been arrested after a stolen car crashed into a horsebox in Theydon Bois. Two 17-year-olds and a 14-year-old were held following a burglary in Purlieu Way on Thursday, where a white Volkswagen Golf was reported missing. Soon after the theft, at about 17:40 BST, officers had located the vehicle and arrested the teenagers. Police say the car may have been in convoy with a black vehicle. All three boys have been released on police bail. A 17-year-old from London was arrested on suspicion of burglary, going equipped, theft of a motor vehicle and possession of a class B drug. Another 17-year-old from Woodford Green was arrested on suspicion of burglary while a 14-year-old, also from Woodford Green, was arrested on suspicion of burglary and theft of a motor vehicle. 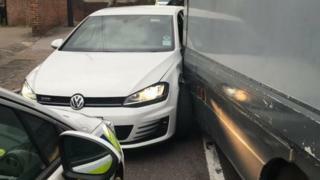 Anyone with dashcam footage of the Volkswagen in the area of B172 Abridge Road to the A113 Ongar Road should contact Essex Police. Police have not said whether there were any animals in the horsebox.